Team Setmore has established priorities for 2018: enhanced payments functionality, a better mobile experience, and opening up more paths to bring more customers to your door. To these ends we’re continuing the good work put in on bringing Square to Setmore (now in alpha testing), and a new online scheduling path through your Instagram page. Keep reading for details. Our upcoming Square integration is now in the alpha testing phase, with a planned beta test to occur imminently. 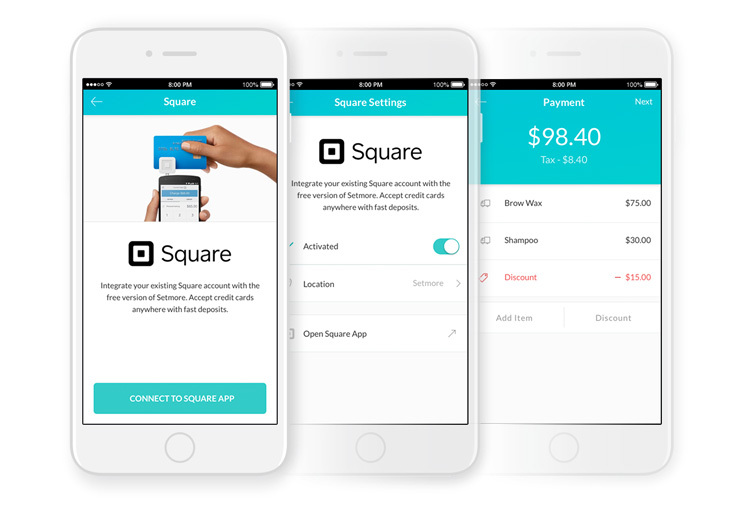 We’re super excited about this integration as Square is not only the go-to name in small business payments, but it’ll also bring delightful experiences and interactions to you and your customers by giving you the ability to swipe, dip, or tap payment cards in person. Use the Square integration with the FREE version of Setmore (no Premium subscription required). Take payments from the Setmore mobile app, Setmore calendar on a desktop/laptop, and let customers pay from your Setmore Booking Page. Once you sign up for Square, get a free magstripe reader from Square or purchase a contactless chip reader. If you’ve got a sizeable Instagram following on your business profile, then we’ve got some great news for you! Pretty soon you’ll be able to add a “Book Now” button directly on your Instagram business profile, that directs your customers to an embedded Setmore Booking Page within the Instagram app. Followers can browse your pics, be stunned by your work, and book an appointment right then and there. This feature is nearing completion and the preliminary launch phase. We’re currently working with the Instagram team to get some initial users plugged in so they can activate the Book Now button, and shortly thereafter it will be available to the general public or anybody with a Setmore account. We’ll post a follow-up message here on the blog and on Setmore’s Facebook and Twitter streams once the feature goes live. The Reviews tab of the Booking Page is now functioning as intended when viewed on a mobile device. A few remaining Booking Page and integration page URLs that were on the HTTP standard have been moved to the HTTPS standard. Fixed an issue that prevented a Booking Page in a non-English language from displaying correctly on a Weebly-powered website. Some email notifications that were not being sent to recipients with a hotmail.com domain are now being sent as expected. Canceling an appointment from an email notification may now only be triggered once. 2-way calendar syncs will now deactivate automatically if a staff member’s profile is deleted. Fixed an issue that caused off-hours and double-booking options to not sync properly with the mobile app. Fixed an issue that caused Setmore to freeze when searching for a customer and then immediately creating a new customer. Fixed an issue that caused Basic Reporting to show the wrong date for class sessions for users in the CDT timezone. When we generate a report in basic reporting, there is no way we can know if an appointment was booked by the customer or by myself, so I cannot know how many customers actually self book themselves. From the 25th to the end of each month I check the update blog daily because I’m always excited to see what’s new. With this being said, I’m disappointed with the recent updates made to the booking calendar. Both from the windows desktop app and the website, my staff continue to deal with constant freezing or getting stuck on the loading screen. We’re almost afraid to click on an appointment in fear of getting stuck on that dreaded “fetching appointment details” popup. Which directly results in the desktop app (usually, sometimes the website) freezing up until closed. When opening the app or visiting the calendar on the website, the Setmore loading screen will continue for eternity if you let it. It does this consistently, and on multiple computers. Sometimes in order to fix it, you have to delete the localstorage cache in the Appdata folder and relogin. Would love to see this addressed. We cannot be the only ones with this issue. It’s been going on for about 2-3 weeks now. We’re prepared to drop our premium membership and move to a custom product, at this point. Hi Alec, thanks for reporting these issues. I checked your account from my computer (using Chrome on a MacBook) and everything is loading at normal speed. What browser/operating system are you using to log in? If you’re using Explorer or Microsoft Edge, I’d recommend trying Google Chrome or Firefox instead just to see if that makes a difference. I’m going to have my team look to see if any recent deployments caused an issue with our Windows local app. In the meantime, try to use Chrome/Firefox, let me know if the issue persists. Also, you can contact our 24/7 chat support anytime from your account by clicking the chat bubble in the lower right corner. When you do this, our support teams have an instant readout of your account and are best equipped to provide support. Thanks for posting! Well done, Setmore. I seriously want to commend the entire staff on a wonderful platform with OUTSTANDING free tools. Setmore gives me a huge booking advantage over my competitors, and my customers tell me that all the time. I’d be interested in a bigger selection of paid products. I’m in the home service industry. What about a function where I can upload my completed job pictures and/or the invoice onto each appointment for easy record keeping. I’d pay $5-10/month for that easily. Hi Sam, I love this idea. We have it on our product backlog currently but our dev team is currently busy with other projects. There’s also some fun complexities involved, such as the ability to store data like this (photo files of various disk size multiplied across tens of thousands of Setmore accounts do take up a LOT of server space). So I can’t say that it’ll happen soon, but I’ll be sure to talk this feature up at our biz leadership meetings coming up. Thanks for posting!